The pretty village of Ashford in the Water, arguably one of the most picturesque villages in the Peak District National Park is situated on the banks of the River Wye around a mile and a half from the town of Bakewell. 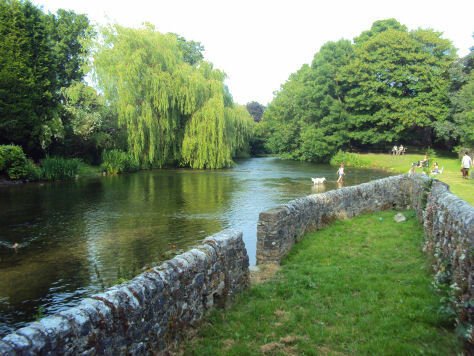 The village's name derives from an Anglo-Saxon source and means `ford by the ash trees'. The Sheepwash Bridge, originally a medieval packhorse bridge, now occupies the the site of the original ford. Lambs were placed in the pen on one side of the river and the ewes swam across the river to reach them, an easy way to clean the fleece prior to shearing, a practice which continued until quite recently. Ashford is recorded in the Domesday Book, as a Royal manor referred to as `Aisseford', it passed to the aristocratic Neville family in 1408, before coming into the ownership of Sir William Cavendish, ancestor of the Earls and Dukes of Devonshire in 1550. 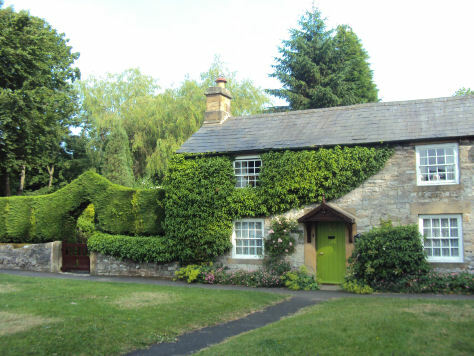 It remained in the Cavendish family for the next 400 years until the houses were sold off individually in the 1950`s to help pay death duties. 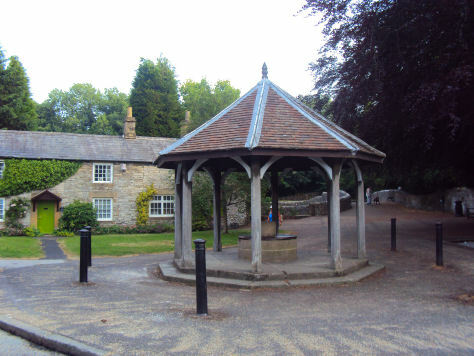 The village is known for the quarrying of Ashford Black Marble, a form of limestone unique to the area, which has been used at both Hardwick Hall and Chatsworth House. An example of an Ashford Black Marble fireplace can be seen in the quaint tea rooms at the back of The Barn Gift & Craft Shop. Ashford Hall was built in 1785 to a design by Joseph Pickford. 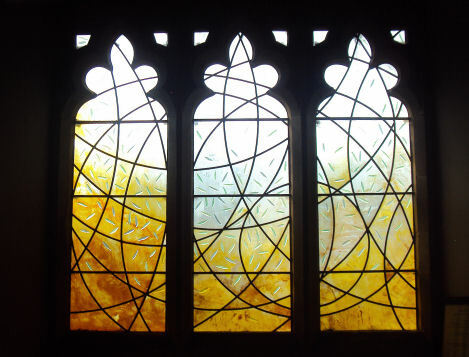 It is owned by the Olivier family ( to whom a memorial window to may be seen in the village church) and overlooks a picturesque lake formed out of the River Wye. The village has 2 pubs, The Ashford Arms Hotel, dating from the eighteenth century, it was once a coaching inn and the Bull's Head, formerly the Turk's Head. A medieval Tithe Barn stands close to Sheepwash Bridge, as does the Riverside Hotel and Restaurant and a small craft shop. Most of the cottages date from the eighteenth century and are built of smoothly textured limestone, light brown in colour, giving a warm and cosy feel to the village. The Rookery dates to the sixteenth century, its spacious lawns run down to a loop in the River Wye. 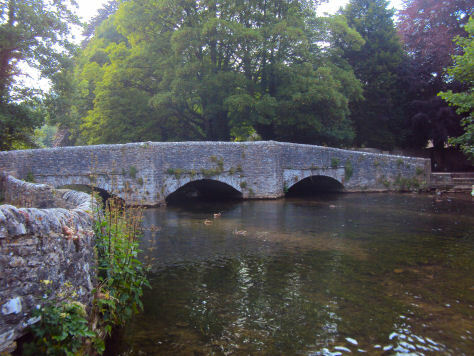 Perhaps the best time to visit Ashford in the Water is in mid-May, around Trinity Sunday, when five wells are dressed in the village according to the ancient custom. The custom of well dressing was revived in the village in 1930 after a break of many years. 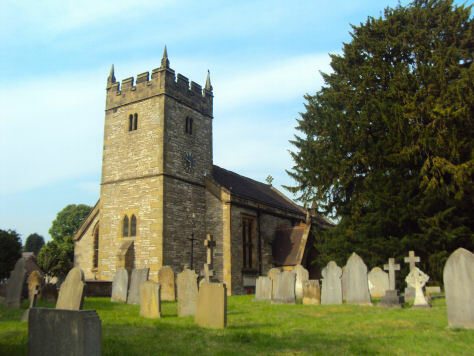 Parts of the village church of Holy Trinity date back to the twelfth century, including the tower, the walls of which are up to one metre thick at the base and the handsome south door with its original Norman tympanium showing a tree of life in the centre with a hog and wolf facing it. During the restoration of the church in the Victorian era this stone was found in the south wall and restored to its original position over the main door. The octagonal, chalice-shaped font dates from the Decorated Period of 1370-1440. The body of a dragon can be seen ‘embedded’ in the shaft, with the head and tail emerging from either side. The church was heavily restored in the 1870s, and much of the building dates from then. An ancient and unique custom practiced in Ashford-in-the-Water was the hanging of funeral garlands, known as 'Maiden's Garlands' from the roof of the church. Four garlands, known as virgin crants”, or crowns, still hang there, the oldest of these dating from 1747. They were made of white paper cut to form rosettes and fixed to a wooden frame. They would then be carried before the coffin of a young virgin in the funeral procession, before being hung up. The windows in the north wall of the aisle are both modern, St. Nicholas, Patron Saint of children, was installed in 1951, and Our Lady with the Infant Christ in 1960. The large window, nearest to the oak screen was installed in 2001. On the north wall is a tablet in Ashford’s most famous product, the so-called Black Marble, commemorating Henry Watson of Bakewell, who opened Ashford’s first marble quarry. In the churchyard stands the base and stump of the market cross, which may date from the fifteenth century. Arbor Low Stone Circle, sometimes referred to as ‘The Stonehenge of the North', a prehistoric site of unique archaeological and cultural interest. The monument is atmospherically set amid high moorland near the town of Bakewell. Fin Cop Hill Fort- scene of an Iron Age Massacre. Dovedale, a dramatic limestone ravine, with its mpressive rock outcrops and tranquil woodlands is arguably the prettiest of the dales in the Peak District National Park and is owned by the National Trust.